Among the mythical dive bars of Buenos Aires is San Telmo’s enduring Bar Británico. The corner bar facing Parque Lezama first opened in 1928 as ‘La Cosechera’ (The Harvester). From the beginning it was a gathering place for English World War I veterans and railroad workers who lived in the area. It wasn’t long before ‘Bar Británico’ became an obvious name for this Anglo-Saxon meeting place and in the 1930’s the name was changed to reflect the predominate clientele of the era. 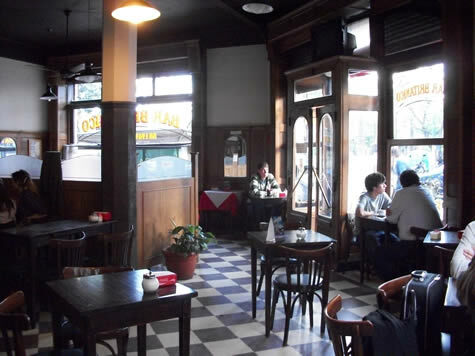 Bar Británico is a famous San Telmo bar/coffehouse that was featured in the film, Motorcycle Diaries. Bar Británico really earned its reputation as the iconic corner cafe of Parque Lezama beginning in 1959 when it was taken over by three Galician immigrants, Pepe Miñones, José Trillo and Manolo Pose. The three humorous Gallegos as they are collectively called, would remain for the next four and a half decades. From the beginning the three cultivated an atmosphere welcoming writers looking for a place to scribble and smoke for hours on end and intellectuals who played epic games of chess. Writer, Ernesto Sábato was said to write part of his 1961 novel, ‘Sobre Héroes y Tumbas’ (‘On Heroes and Tombs’) at his pocked wood table by the window. During the Malvinas/Falkland War, the first three letters of the bar’s name were camouflaged to alter the name to the much less controversial — if nonsensical — ‘Bar Tánico.’ The sign stayed that way for years until the anti-English sentiment faded and the three letters were once again uncovered on the awning outside. 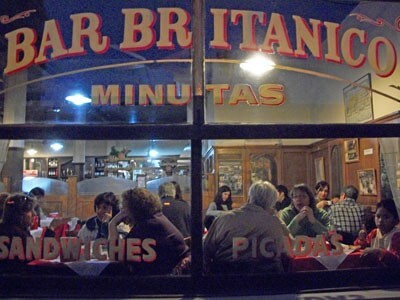 In 1998 Británico was one of the first bars elected for its cultural significance as a ‘notable bar’ by the Buenos Aires’ city government. In 2006 the existence of Bar Británico was threatened, stirring up a controversy of typical porteño proportion. The three Galicians were evicted after the owner of the building died and his son, Juan Pablo Benvenuto, decided the place could be fixed up to fetch a higher rent. The community was outraged –- the Galicians had rented the bar from the same family for decades without a formal contract –- but it was true that the bar hadn’t been reformed since the 1950’s. The floor was missing tiles, the bathrooms were a disaster, and decades worth of dust covered the copious amount of knick-knacks around the bar. Neighbors held protests, collected signatures, started protest blogs and facebook groups to save the bar and the livelihood of the three Galicians who had watched many of them grow up. Enough signatures were collected that the city’s Culture Secretary intervened to see if the building’s owner could come to an agreement with Miñones, Trillo and Pose. The three, at this point elderly gentlemen who shuffled across the floor to take orders thanks only to the force of will, said that if they had to go they at least wanted to pass the bar on to people within their inner circle, including one waiter who had worked there for 25 years. Thanks to the building’s listing as one of the city’s ‘historic heritage site’ and the cafe’s ‘bar notable’ status the owner was impeded from changing the character of the interior but the three Spaniards had no legal recourse to remain as the bar’s owner-operators and were forced to retire. Six months after the ousting of the Galicians, Bar Británico was reopened under new management, who purchase the rights to continue using the same name. 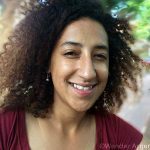 New visitors probably won’t miss the Británico of old –- you can still sit at a sidewalk table and watch the people coming and going from Parque Lezama, or park at a window seat and nurture Porteño neurosis with one coffee after another. The menu and the food are admittedly as uninventive and average as ever. Británico’s new owner, Agustín Souza refurbished the original wood bar, replaced the plumbing, electricity and floor tiles. The coffee is the same –- Souza buys the same brand as the former owners. The prices are certainly higher, but there’s no telling if that’s solely due to wacky inflation or a concerted effort to capitalize on the foreign tourists coming by to see one of the locations for the film ‘The Motorcycle Diaries’ and get whiff the Buenos Aires’ of yesteryear. Some neighbors still maintain the attitude of scorned lovers toward Británico — they say it was once ‘their place’ and now they don’t belong — the grumpy decrepit charm is gone, they can’t even stop by to use the bathroom like the always did and without the grandfatherly Galicians, the very soul of Británico has been sucked away. Sentimentality aside, Británico lives on, and former customers can hope that after 45 years of tending bar, the Tres Gallegos are enjoying their involuntary retirement. Souza, an inexperienced bar owner, concedes that he has very big shoes to fill. “It is a lot of work. There were three of them and I’m only one person,” he says. He initially kept the bar open 24 hours a day, save Tuesday mornings, restoring Brtitánico’s former reputation as the night owl’s old San Telmo standby. Today it usually closes in the early morning, around 3:00 a.m.
• Hours: Open until very late everyday, closed on Tuesdays from 12:00 a.m.—8:00 a.m.